Fruit Fly Feast (PRO) - Drosophila Culture Medium - 25 lb. ANNOUNCEMENT!! 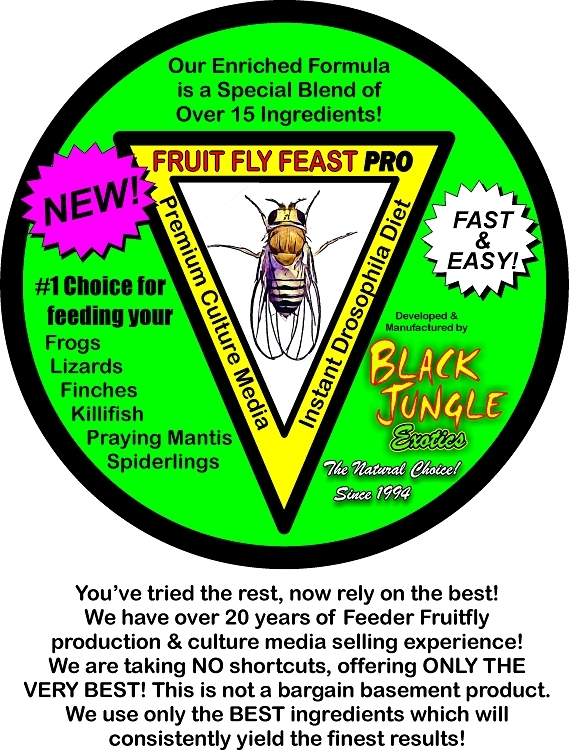 Black Jungle Exotics is happy to inform you that we have developed what we think is the VERY BEST Drosophila flightless fruit fly culturing media available today! It's called FRUIT FLY FEAST. Our 20 plus years of fly culturing experience has guided us in formulating a newer product that is fast and easy to prepare instantly yet offering incredible yields! Now available in our economically priced STANDARD or our enriched PRO formula! While many of our competitors formulas only include about 4 basic ingredients, Our Standard formula uses 9 ingredients and our PRO formula includes 15 ingredients! The PRO includes Spirulina, Honey, Coconut Palm Sugar, Coconut, Oats, Banana, Flax, and Molasses to name a few! Our secret is out but we aren't giving away all our secrets so why not give it a try for yourself? This is our very own new formula of media that we trialed and were so thrilled with the results that we decided to release it to the public! It does a fantastic job with both D. melanogaster and D. hydei. Easy to use instant formula mixes with cool tap water, no heating required. Both the STANDARD and the PRO formulas are offered in a range of sizes from 1/2 lb. bag to a 25 lb. bucket for use by beginner hobbyists to advanced breeders and zoos! For D. melanogaster, add 1/2 cup of formula powder to your clean fly container, then add 1/2 cup of room temperature water. Mix well as it sets up quickly. Add a loose wad of Excelsior, then add about 50-100 adult flies and cover container. For D. hydei, add 3/4 cup of formula powder to your clean fly container, then add 3/4 cup of room temperature water. Mix well, then sprinkle a pinch of bakers yeast on the surface immediately. Add a loose wad of Excelsior, then add about 50-100 adult flies and cover container. Fruit Fly Feast (PRO) - Drosophila Culture Medium - 2 lb. Fruit Fly Feast (STANDARD) - Drosophila Culture Medium - 1 lb. Fruit Fly Feast (STANDARD) - Drosophila Culture Medium - 10 lb.